Shortly after I learned to read I started getting up early every Sunday to read the funnies, poring over each strip from Prince Valiant to Peanuts. One of my favorites has always been the latter which explores themes from the silly to the profound. One of the best parts of living on the road is the chance to learn new things and go deeper on subjects. 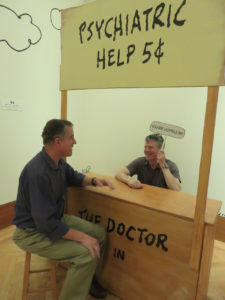 I thought I knew a lot about Charles M. Schulz, the author of Peanuts, until we went to his museum in Santa Rosa earlier this week. The Schulz Museum is located right next door to a community ice rink that he had built in 1969. We toured the museum with our friend, Mark, who frequented the arena when he was about ten years old. Schulz, known as “Sparky,” was approachable and drew cartoons for Mark and his friends. During our tour, we were guided by George Herrmann, who retired from a career in technology that included working with Apple on the first iPhone. 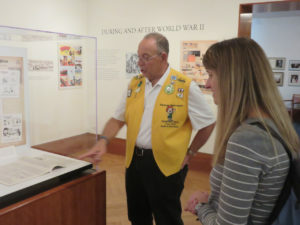 He now devotes many hours as a docent at the museum. His knowledge and enthusiasm made our visit much more fun and he shared some great stories. 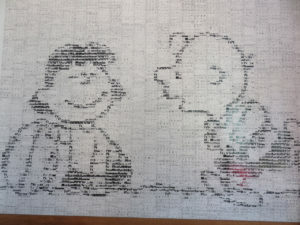 One interesting tidbit relayed by George was that the theme of Charlie Brown’s unrequited love for the “little red-haired girl” was based on a co-worker at the Art Instruction Inc. company where Schulz worked. He proposed, but her mother suggested that a cartoonist had poor prospects, and she turned him down. In honor of Charlie Brown and Charles Schulz’s frustrated courtship, red heads get into the museum for free every Valentine’s. If it’s not your natural color, you can invest in a dye job just for the occasion. During our visit, we saw several art installations related to the strip. At one end of the main hall is a large mural of the infamous theme where Charlie Brown attempts to kick a football held by Lucy—who in every case but one—pulled it away at the last moment. The one time that Lucy didn’t pull back the ball at the last moment…Charlie Brown missed. 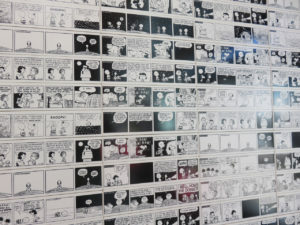 When you get close to the black and white mural you can see that it is composed entirely of Peanuts comic strips printed on ceramic tile. The museum also features rotating exhibitions. The theme of the most recent one was Mr. Schulz Goes to Washington—an appropriate attempt to add some levity in this election year. The current exhibit is perfect for writers: It Was a Dark and Stormy Night based on Snoopy’s never quite launched literary career. If you’re looking for a gift for an author friend I’d recommend Snoopy’s Guide to the Writing Life which features related Peanut’s strips and essays by thirty authors and entertainers. Sparky was a World War II veteran where he was a machine gun squad leader. On the only occasion he had to fire his gun, he found he had forgot to load it. Fortunately for him it was toward the end of the war and the German soldier he had targeted willing surrendered. I guess that Schulz was destined to be a cartoonist. One thing we learned is that his nickname was bestowed by an uncle, based on the comic strip horse, Spark Plug, in Barney Google. Charles “Sparky” Schulz died in his sleep of colon cancer on February 12, 2000. The very next day his final original strip appeared in print. strip, which is published in almost every newspaper in America. And, in a great Santa Rosa museum. Travel Update. After spending several days in the Sonoma Valley north of San Francisco we’re staying to the east of Oakland where we’re meeting up with Frank and Sheryl, former neighbors. We had lunch with Julie, one of my former co-workers and met her husband, Michael. We’re blessed to have so many great friends. Get to meet up with even more tomorrow. The Charles Schultz museum was on our list when we went to Sonoma in January, but we got sidetracked by so much good wine. We’ll have to skip a tasting next time and visit the museum! 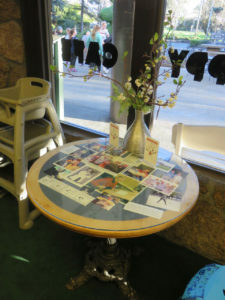 We did hit a few wineries–but it was fun seeing the other side of Sonoma. I remember once when I was trying to encourage you toward a relationship with God I took all the books off the coffee table & put a bible there. You would come home from jr High & first thing sit down on the couch & read what was in front of you. That day you picked up the bible & read it for a while. I don’t know why I didn’t keep doing that. I am so pleased you & He are great friends now. of Peanuts probably since the beginning, and once again in the reruns. what being the “head beagle” really means, it’s funny he discards that role fast. It was cool to learn so much more about the strip and the person behind it–and learn he was liked in his community. I went to the wrong place for help? How funny!